Tours de Sport Hot Deals: SAVE 25% ON ANY 3+ NIGHT STAY THIS SPRING AT FAIRMONT BANFF SPRINGS & CHATEAU LAKE LOUISE! SAVE 25% ON ANY 3+ NIGHT STAY THIS SPRING AT FAIRMONT BANFF SPRINGS & CHATEAU LAKE LOUISE! Save 25% on your stay when you reserve your visit at one of these Fairmont flagship hotels! This eliminates ALL excuses for not visiting Banff/Lake Louise/Sunshine this Spring! Everyone we send to these fabulous properties comes back raving about their experience. Your savings could range from $200-$1,000+ depending on your dates and accommodations chosen! 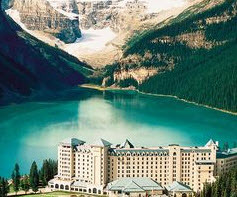 Few hotels in the world rival the majesty, hospitality and grandeur of The Fairmont Banff Springs resort. For more than a century, `The Castle in the Rockies' has provided the unique blend of luxurious comfort, individualized service and timeless beauty for the most discerning traveler. Styled after a Scottish Baronial Castle, The Fairmont Banff Springs is located in the heart of Banff National Park, a UNESCO World Heritage Site. With such a setting the hotel offers stunning vistas, world renowned skiing within minutes, exceptional regional cuisine and the grand Willow Stream, the spa at The Fairmont Banff Springs. The Fairmont Banff Springs offers all the amenities of a world-class resort, with 768 superbly appointed guest accommodations and attentive, personalized service. From cozy rooms tucked away in quiet corners of the castle to spacious suites with sweeping Alberta mountain views, The Fairmont Banff Springs has the perfect room for you. Located in the heart of pristine Banff National Park, and within a UNESCO World Heritage Site, The Fairmont Chateau Lake Louise is recognized globally for progressive environmental stewardship and responsible tourism, values at the heart of this historic resort. The journey to this treasured Chateau is a scenic drive featuring unparalleled vistas of soaring mountains, roaring rivers and abundant wildlife; just two hours from Calgary via the Trans Canada highway. In 1882 Tom Wilson, the first non-native to view Lake Louise, described the moment he discovered these sights by saying "I never, in all my explorations, saw such a matchless scene". His opinion also happens to echo the sentiments of our guests upon seeing their rooms. Elegant and polished yet relaxed and inviting, The Fairmont Chateau Lake Louise accommodations strive to live up to the natural wonder with which they share their name. Unwind where the luxury of a bygone era has been perfectly preserved in a guestroom or luxury hotel suite with a heightened level of modern accommodation, heartfelt welcome and genuine service. Great on-site dining, shopping, and recreation options abound, plus enjoy the 10 minute complimentary shuttle to the Lake Louise ski area. Get 25% off a 3+ night stay at either hotel. Book and deposit between March 2 & March 12, 2016. Travel must start on March 9 or later and be completed by April 30, 2016. Must book at least 7 days prior to desired arrival date. Blackout dates are March 25-27 inclusive. Complete any online quote for the properties listed here, and your discount will be automatically applied. If you prefer, contact your sales representative for assistance or more details at 888-754-2167. Please go the Banff/Lake Louise/Sunshine Ski Vacation page to start your custom trip quote for Banff.